First off, Nexo Knights has made me nostalgic for KK2. 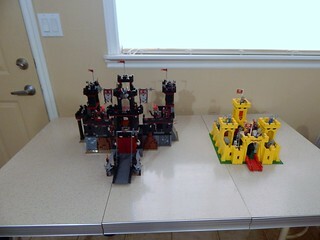 (Yeah, all you old people are looking at me weird now) All this nostalgia made we want to rebuild 8877 Vladek's Dark Fortress (You have to admit, at least the Shadow Knights were awesome) Immediately after completing it, I noticed it bore a striking resemblance, layout wise, to 375 (Yellow) Castle. Look at that. drawbridge, center tower, two identical towers off on each side, come one! It has to be more than coincidence. You have a solid argument here. I never noticed the similarities. Sharp eyes! I agree. Good eye and good comparison. I know you are a big yellow castle fan, so I shouldnt' be surprised.